Free entry, however donations will be gratefully received. 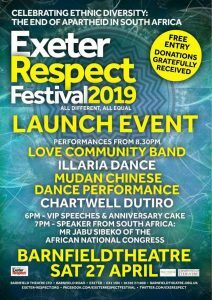 Now in it’s 22nd year, Exeter Respect Festival’s theme is Celebrating Cultural Diversity and the End of Apartheid in South Africa. It is 25th Anniversary to the end of racial segregation in south Africa, on 27 April 2014 was the date of the first democratic election in South Africa. 25 years on, what has happened in south Africa since then? 8.30pm performance programme with: Mystic Mbira Music – a mbira duo formed by master mbira player Chartwell Dutiro & Jori Buchel. Chartwell Dutiro is a Zimbabwean musician, singer, songwriter, composer, author and teacher. Chartwell is a maverick master mbira player with a story that begins in the sacred musical rituals of his home village. Illaria Dance to the rhythm of Egyptian folk music. 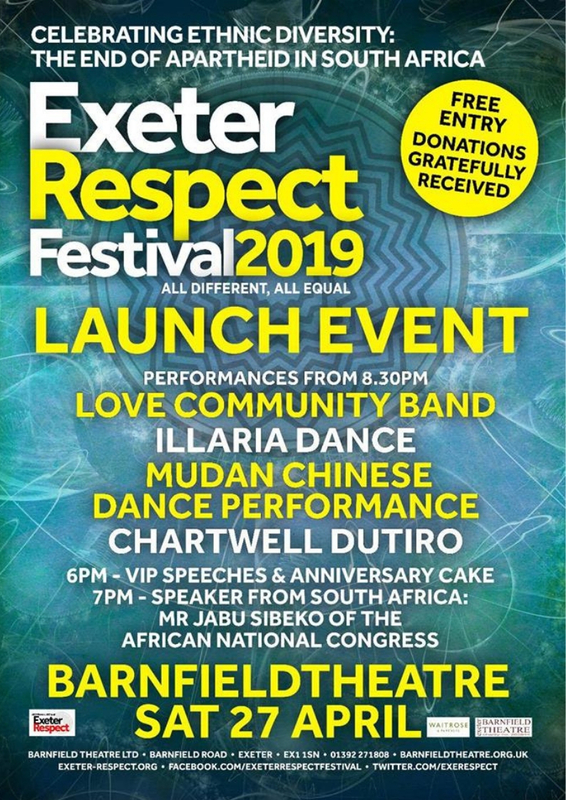 Love Community Band, a World music ensemble with Aliya Arafa, singing Arabic songs and more World music from different & diverse local musicians many of whom are students at Exeter University.